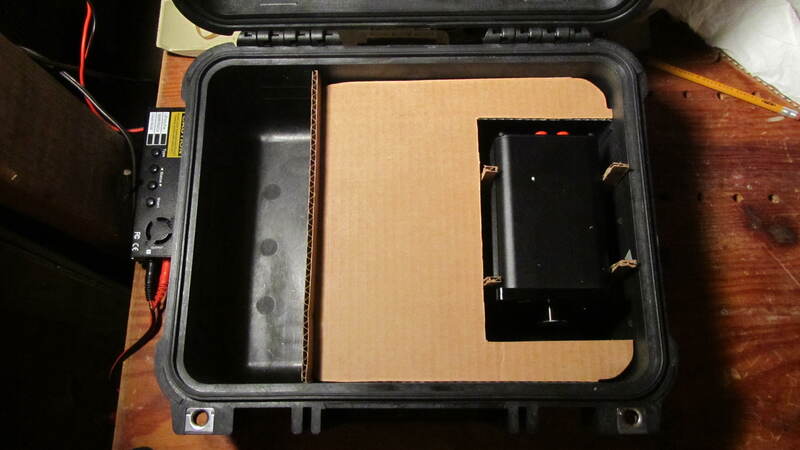 Building an energy dense, functionally versatile, and weather proof portable power solution was the design goal with version 2.0 of the Solar Briefcase. 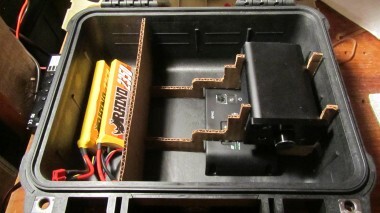 I set out with a goal of building a unit so versatile that you could use it as a base power system for all of your remote power needs. The system can fit the base unit and a single outdoor speaker into a backpack and can be easily transported in this way. It will play music for over ten hours on two fully charged batteries, and with a 40 watt panel in direct sunlight will charge faster than it can use the power at a loud listening volume. 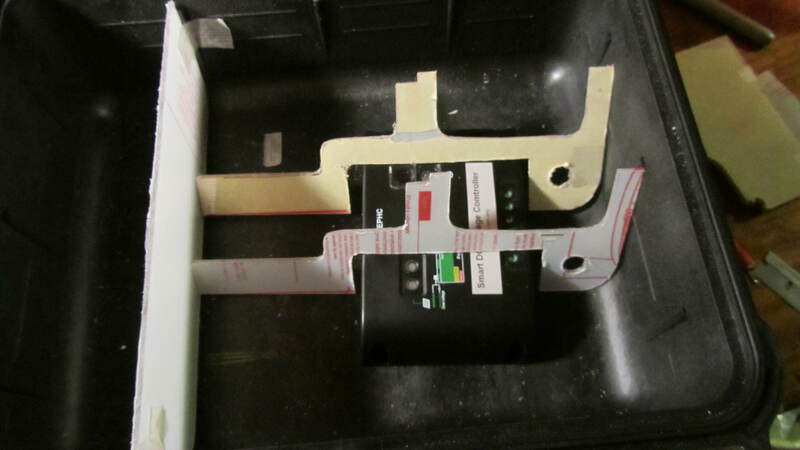 All loads are directed through the charge controller with a 10 amp working current. The charging unit manages the power from the lithium polymer cells, which is necessary because drawing down a lithium ion/polymer battery below ~3.5 volts per cell will damage a lithium battery. 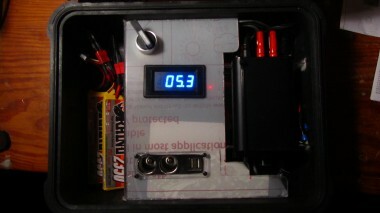 The system will automatically shut down power distribution when this level is met and the batteries are considered drained. A folding solar panel would easily fit into the lid of the case, however the initial one I tested was returned due to poor performance. Power Film panels are among the best in the industry and a 20 watt panel will cost just under $400, which is why I have delayed this purchase. I currently use a MonoCell 40 Watt Panel that can charge at 2.5 Amps in direct sunlight. 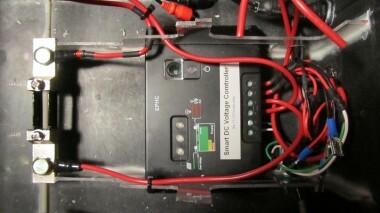 The unit can also be charged from any 12v source. 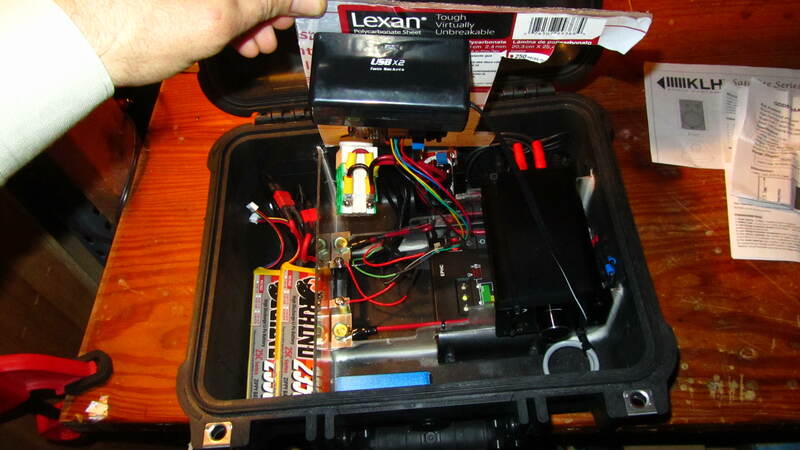 Lithium Polymer batteries offer a 5 to 1 weight reduction over Led Acid batteries. Built in Lighting makes it easy to use at night without a flashlight. 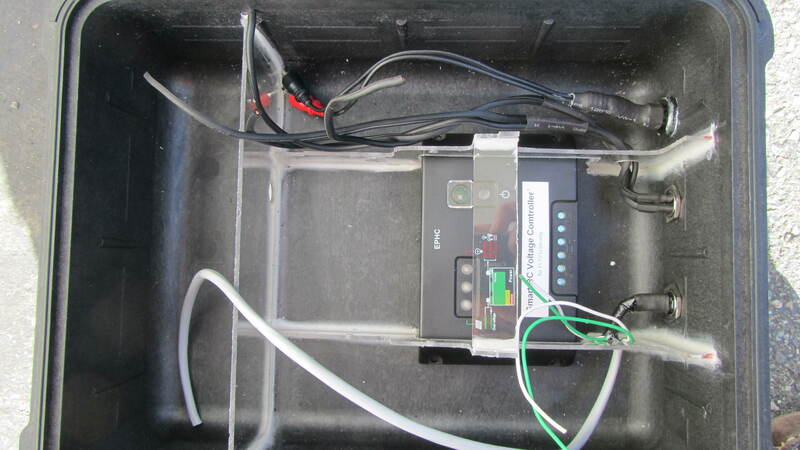 Voltage/Amperage indicator allow for easy gauging of power use out of the unit. Sourcing the individual electrical components that would make up the system took much longer than building it. I did not want to jump to buy the first of any given piece that I found, so for several months prior to beginning construction I worked along with my friend Travis in google docs to conceptually design the unit. We used a shared document to go back and forth with comments on wiring considerations, component options, layout discussions, etc. Every aspect was discussed and thought out ahead of time and it was helpful having someone else to bounce ideas off of. I was not in a rush to complete the project so this process was fun for me. The results of our collective document is listed in the Part Sourcing and Wiring Diagrams & Blueprints section. If you are interested in building one of these for yourself then this will be a very useful resource. Initial mock-up of the components began with a universally available templating material: cardboard. I cut the pieces as accurately as possible and fitted the central components in order to determine the layout of the components in the case. 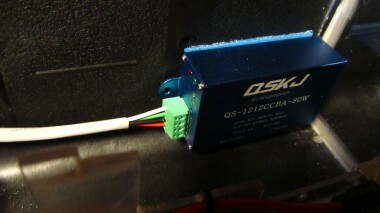 I wanted to establish a high component density, and so layering the charge controller and amplifier was critical. Mocking this up properly was necessary in order to determine if my concept layout would work functionality. This is good to do before spending the time and money in cutting Plexiglas, and additionally the templates you create can be easily drawn onto your final material to simplify cutting and fitting. 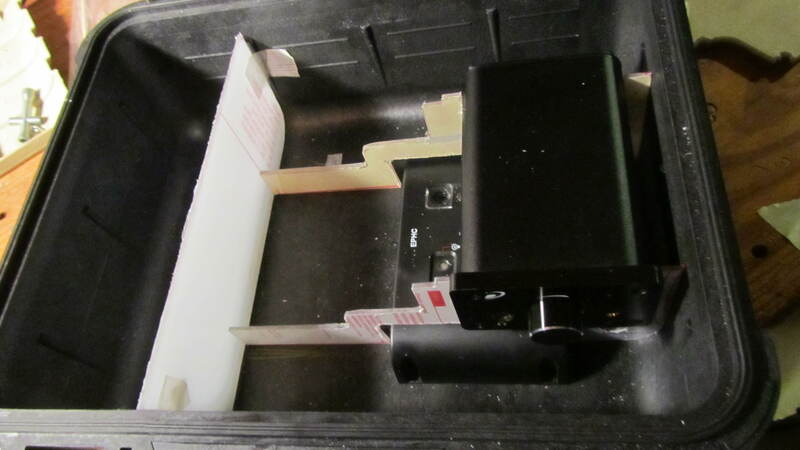 I wanted the system to be allowed to work while locked and sealed, and this required universal external connectors. 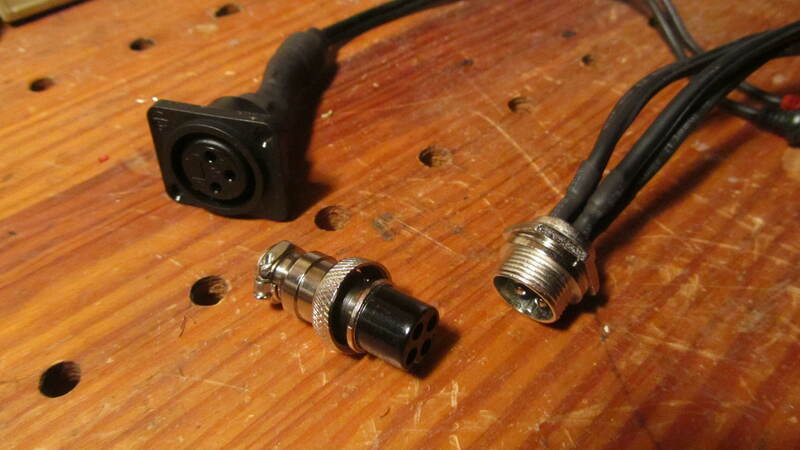 I selected a standard, 4-Pin Amphenol connector, of which I sourced from e-bay. 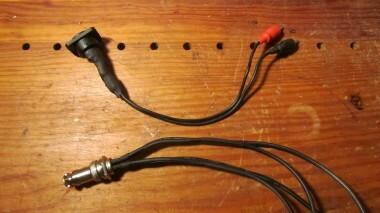 For the audio input I selected the recording and entertainment industry standard XLR connector. Building the connectors themselves takes some time and patience, as the small pins need to be carefully soldered in order to keep them isolated from each other. Each connection was then shrink wrapped when possible. Having these built ahead of time made the installation go much quicker, and provided a few nights worth of after-work projects. Once the Plexi was cut, it test fitted, filed where necessary, and glued into place using white liquid nails. Plexiglass was selected because it is light weight and flexible. It also does not deteriorate. For these reasons it is better than wood, which was used in V1 of the Briefcase. Initial wiring was routed, all connections were soldered and shrink wrapped, and potential wear points were also shrink wrapped. 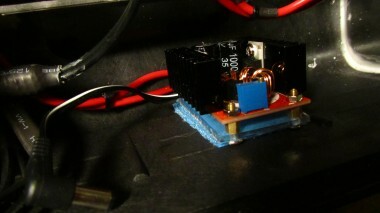 The best wire I had available was a red, 14 gauge wire which was used throughout the case. I had black wire but it was not of the same grade and I chose to use the red wire instead, wrapping electrical tape around the ends of the negative in order to differentiate it. A shunt was installed on the left side of the picture. This added some weight but made it possible to have the built in amperage meter. The Amp meter is connected to both sides of the shunt and the resistance delta is measured across the terminals to determine the current flowing through the system. 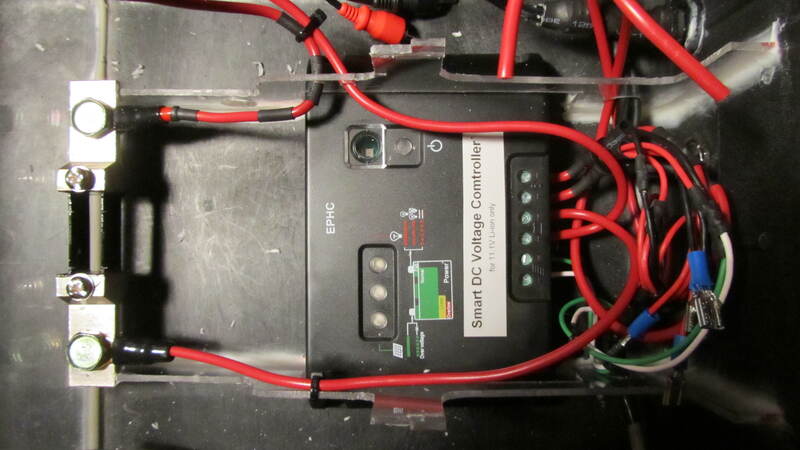 All power used from the batteries flows over the shunt, and all power use required from individual components is managed by and outputted from the Solar Charge Controller. The DC/DC Buck/Boost circuits were installed next. Two separate units were selected and purchased for this project in order to provide voltage flexability for additional components. On the Left is DC/DC Boost Converter that can take 10-32 volts DC and convert to any range between 12-35 volts as a Step Up only power supply. In other words this unit cannot reduce voltages. This unit provides 24v to the Dayton DTA-100A T-Class amplifier which is designed to be powered by 24 volts. I put a small 1,000 uf capacitor after this unit’s output and before the amplifier to smooth out the power further, however the unit does contain two 1,000 uf capacitors on-board already so this was not necessarily required. On the Right is a DC/DC Converter Auto Boost / Buck Power Supply that can be adjusted to provide any voltage between 8 and 30 volts DC with an output current adjustable from .5 – 6 Amps. The purpose of this unit is to allow the case flexibility for many uses. This component is hooked up to the Voltage Output wire, which is in pair with the solar input connector. It can allow you to run anything in the stated range of power and can both increase and decrease output voltage regardless of input voltage. 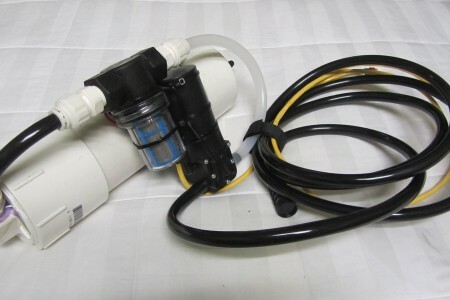 Most recently I have used this to run a diaphragm water pump for a water filtration system. The variable voltage settings allow me to dial down the pump to the speed that works best for my application. 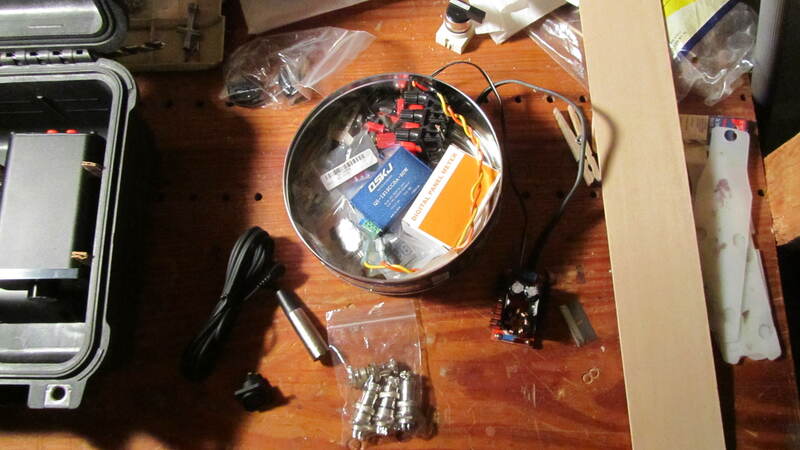 Here the components are going in and the amp is being installed. If you look close you can see the multi-colored wire with white connector that plugs into the back of the LCD meter on the front panel. The wires in use here are the two which read the current crossing over the shunt, and the others must connect up to a power source that is isolated from the source being measured from. This is required as to not affect the metering. To solve this without installing a separate battery I used a very small, B0505S-1W voltage isolation module, which cost about $1. 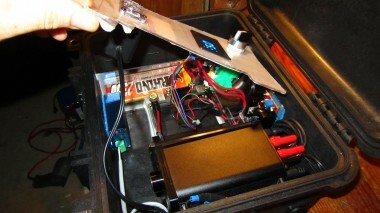 Here the face plate is installed with the master power switch, LCD and Cig/USB power box installed. 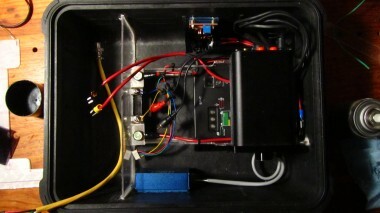 Here is the first look at the system together and powered on. The face plate of the system is now on with all of the components installed. The big switch I used to switch between battery 1 and 2 is installed. That switch may or may not be necessary, but the design consideration ended up making it into V2 after having it in V1. One of the reasons I had a switch, or several, in the V1 design was so that I could charge and play off opposite batteries if I wanted to. Because of the need to monitor Lithium battery voltage levels in order to prevent a low voltage situation, all loads have to be run through and managed by the charge controller. This makes it impossible to charge and play on separate batteries. Still, it provides a good way to keep power on reserve as well as easily shut down the system without unplugging batteries. 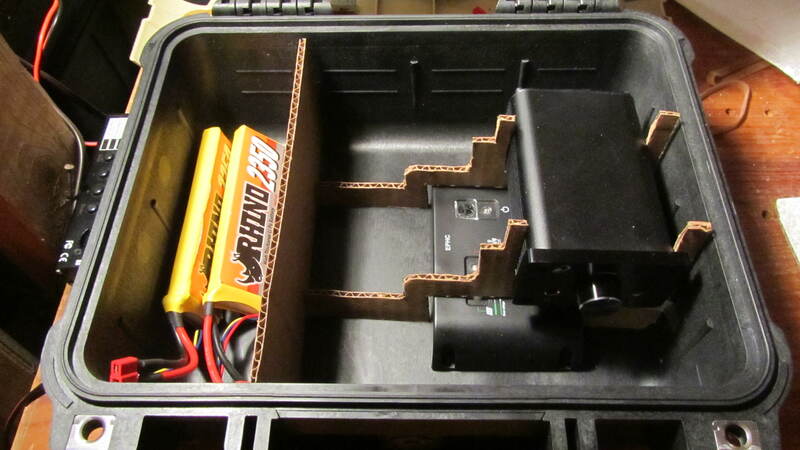 Since building v2 of the Solar Briefcase in the snow-less winter of 2012, it has seen several weekend camping trips, entertained beach and backyard parties and has performed flawlessly in the field. I am now working on developing new ways to use the system, the next one being a water filtration system. Stay tuned for more updates, pictures and add-on’s to the Solar Briefcase.